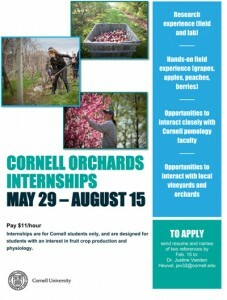 If you’re a Cornell student with an interest in fruit crop production and physiology, a new internship program at Cornell Orchards could be a great career stepping stone. Interested? Send resume and names of three references to: Dr. Justine Vanden Heuvel, jev32@cornell.edu.